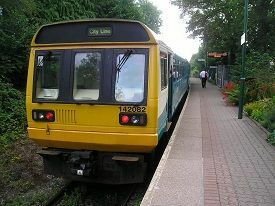 The train I get leaves from platform 1 of Cardiff Queen Street, having started its journey at Radyr, via Cardiff Central. Lots of commuters get off the train and once I am on it, it is less than a quarter full. We go past offices and shops and then turn off the main valleys line to go right along the line to Rhymney. There are new houses on the left at first and then its terraced houses on both sides. There are sins here that the track bed once had four tracks. There are now more modern houses and we go over the A48 and then onto an embankment. There is a graveyard on the left and semi-detached houses on the right as we speed up to 40 mph. The track side becomes very overgrown with vegetation, before some modern detached houses appear on the left. Our track then veers off to the left, whilst the Rhymney line goes off to the right. We soon come to a stop at Heath Low Level station, which has a single platform on the right with a large red brick shelter, without any graffiti in it. You can see the remains of the other platform on the left as we move away onto an embankment. The wheels screech loudly here as we turn towards the left. There are semi-detached houses on the left and woodland on the right. We pass some industrial units on the left and then come into Ty Glas station, where most of the passengers seem to get off. It's another modern looking platform, with a single shelter. We then only go about 100 yards before we arrive at Birchgrove station. It has a turquoise coloured shelter on its single platform. No one gets on or off. There is a playing field on the left and then houses appear on both sides as we pass through a low cutting. We then go another 200 yards before we stop at Rhiwbina, which has an aluminium framed shelter on its single platform. Four passengers get on here. You can see a park on the left and houses on the right, then flats on the left. After another 200 yards we stop at Whitchurch, which has a turquoise shelter and a public telephone box, both of which have been heavily grafittied. There are semis on both sides now as we pass through a low cutting for another 200 yards and then come into Coryton station. It has a single platform on the left side and a buffer stop at the far end.